At a time when policymakers are tasked with developing innovative solutions to increasingly complex policy problems, the need for intelligent policy design has never been greater. A rekindling of the policy design discourse has emerged over the last few years, in response to the globalization ‘turn’ of the late 1990s – early 2000s. This approach eclipsed design thinking by situating policymaking around simplistic dichotomies of hierarchy vs. network governance and state vs. market instruments. Experiences from the resulting poor designs have increased the awareness of the many dilemmas of sound policy design. Our paper distils these lessons of the unique characteristics of the policy formulation process and presents a roadmap for the “new” policy design orientation that has occupied more recent policy studies. We argue the policy design orientation maintains a systematic, means-ends understanding of policy formulation which helps understand and inform these processes. It also underscores the differences between the purposive activity of evidence based policymaking and the less technical and more overtly political varieties of policymaking. 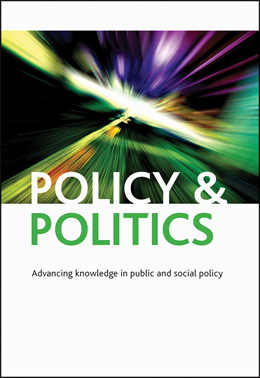 Although acknowledging that policy making need not always result in methodical analyses of policy issues, the design orientation calls for policymakers to base their analyses on logic, knowledge and experience rather than upon purely political calculations, bargaining, habit or opportunism. Even in cases where policy processes are more contingent and politically-motivated, the design of a policy response can conceptually be divorced from its actual creation and potential alternative designs evaluated in terms of criteria such as feasibility and efficiency. Design in this sense is depicted as an ex ante process in which the technical knowledge of how policy tools work are combined with the practical capability of governments. In this article we chart the evolution of policy design studies that began with the very origins of the policy sciences in the 1950s and proliferated until the 1990s. We draw attention to two dimensions of the design experience which emerged during this time: dealing with the procedural aspects of formulation (thinking about ‘design’ as a verb), and with the substantive aspects or content of policy itself (looking at ‘design’ as a noun). We argue that studies of policy tools from the 1980s and early 1990s that focused on policy implementation, instrument classification and choice, however, tended to over-emphasize design as a ‘noun’ and paid much less attention to policy formulation processes. Drawing lessons from the formulation failures of the globalization ‘turn’ and reinstating the design-as-verb focus, we argue that a ‘new’ design orientation has emerged from the late 2000s. Where earlier policy formulation studies emphasized single policy tool choices and assumed simple (time and space delimited) policy contexts, the ‘toolbox’ focus of the new orientation expands to include deliberately-designed bundles or portfolios of multiple policy instruments that are targeted at multiple policy goals and expected to meet multiple policy objectives. The new orientation also emphasizes the impact of history and the evolution of a policy design space in determining the amount of ‘elbow room’ policy designers have to work with in specific circumstances. As a final contribution, our paper outlines ‘first principles’ for policy mix or ‘toolkit’ design that are useful in evaluating policy design processes. These include notions of maximizing “complementarity” between instruments in a policy mix and the need to ensure “goodness of fit” with existing governance arrangements, both subjects with which contemporary design theory and theorists and practitioners are grappling. If you enjoyed this blog entry, you may be interested in a similar article: Toward policy coordination: alternatives to hierarchy.